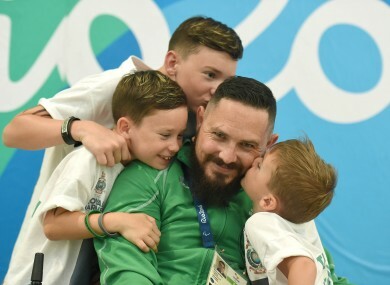 Phil Eaglesham shares a lovely moment with his three boys in Rio yesterday. THERE WILL BE no happy ending to this story. It’s a tale of unimaginable sadness and anger; a heartbreaker. As Philip Eaglesham took to the firing bay yesterday, he did so with his family sitting directly behind. His wife, three kids and parents. He was doing this for them. A 30th placed finish in the 10m Air Rifle qualifier wasn’t the result he wanted, but he was here representing Ireland at the Paralympic Games. By the time the circus rolls into Tokyo in four years time, he may not be around. Six years ago, Eaglesham was serving as a Corporal with the Royal Marine on his second overseas mission to Afghanistan. He had worked hard to get to where he was and life was good. At the age of 29, he was in his prime. On his return journey home to Dungannon, Eaglesham was admitted to hospital in Cyprus with what seemed like symptoms of the flu. If only it was that harmless. Five weeks later, doctors delivered the diagnosis; Q Fever, a bacterial, incurable, disease that is spread to humans by infected animals. He contracted it in the line of duty. The illness has left him using a wheelchair and despite treatment, his condition continues to deteriorate. Everyday is a struggle and the nature of the disease means there is no indication as to how long he has left. The only prognosis is deterioration. As Eaglesham emerged from competition at Rio’s Olympic Shooting Centre, he was greeted by Travis, Tyler and Mason. They congratulated their Dad, gave him a big hug and posed for photographs. It was difficult not to have a lump in your throat. The father of three has openly spoken of the anger he feels at not being able to fulfil his role to the best of his ability. Even the most simplest of tasks, like playing with his children, can leave him bed stricken for days after. Two years ago, he slipped into a dark place. He grew a beard so people wouldn’t recognise him. He felt ashamed. The mental torment of what had happened and the way his downward spiral was affecting his young family became too much. He wanted to end his life. “I didn’t want to be alive anymore,” he said. “I had enough of life. I’d just had enough of the deterioration and the impact it was having on my wife, the kids, others around me. I was sitting in a chair in a room with the curtains closed. I didn’t want to move. “Not being able to play with my children affects me more than I could ever explain. Even things like playing with Lego or building a jigsaw puzzle can be difficult. I get tired and frustrated very quickly. On this stifling hot Tuesday afternoon at an old military base in the suburb of Deodoro, Eaglesham is doing just that. His first Paralympic competition may have ended before the medals were being handed out but, if truth be told, the result was largely immaterial. The last line is telling. In a number of interviews before the Games, Eaglesham was strikingly downbeat. He emphasised that this would probably be his one and only chance to compete and he could be dead within a year. His outlook has changed somewhat and it’s encouraging to hear him speak of Tokyo and beyond. “It’ll only help the kids as life goes on as well, when things get tough, they can turn around and see Dad, what happened to him and where he went to,” he continued. Sport, and shooting, has given him an outlet. Something to be positive about, to work towards and to occupy the mind, although his training schedule is restricted to just four one-hour sessions per week because of the physical and mental toll it takes on him. “Rather than just sitting in the house all day resting, I feel normal. It gives me a sense of being a Marine again. It takes me back to who I was probably more than anything. “I only qualified with Team Ireland last October, not even a year yet, and we took it upon ourselves to go to three or four competitions and qualify; believed in ourselves and the shooting team believed in me and that’s the biggest thing. “Everything I have done in my life has been brought to this one point. So it’s made me who I am. The discipline that the military has given me has all worked into the shooting. “I probably wouldn’t have been the best with a big sniper or anything like that but now I’m a 10 metre sniper. The fundamentals were there but it’s a completely different ball game. Amid all the difficult days, yesterday was one to savour and cherish for the Eaglesham family. Philip’s father, John, was capturing it all on camera and while there was no final to look forward to, there is now light at the end of the tunnel. “We live for here and now because we don’t know what state I’ll be in next year,” Eaglesham concludes. Email “'Two years ago I was at the darkest point of my life. I didn't want to be alive anymore'”. Feedback on “'Two years ago I was at the darkest point of my life. I didn't want to be alive anymore'”.